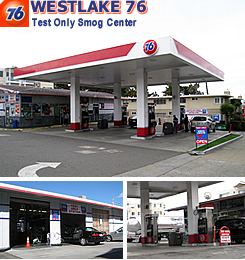 $36.75* Daly City Smog Check Coupon - Westlake Smog Check - 101 South Mayfair Ave., Daly City, CA. Phone: (650) 991-2182. Local Daly City Smog Station. Address: 101 South Mayfair Ave.
We are conveniently... located on John Daly Blvd. by the Boulevard Cafe at the 76 Gas Station! Shop Hours: MON-SAT 8AM to 5PM. No appointments necessary. Smog Special: Only $36.75* with your SmogTips coupon for 2000 & newer cars. Plus Get... One FREE Re-Test! We want you to pass the first test! We look forward to seeing you soon! M/C, Visa, & debit cards accepted. *+ $8.25 CA certificate. Coupon applies to all 2000 & newer vehicles only. Add $10 for 1996-1999 models. Add $20 for 1990-1995. More certified smog station near Daly City, CA.